Tonight I wasn’t really sure what to make for dinner. I wasn’t really in the mood for any standards, nor did I find any recipes that sounded good to me. I kind of wanted burritos, but we didn’t have any avocados, and they are much better with avocados. I was also a bit in the mood for Italian, and had a hankering for barbecue sauce. So I decided that pasta with a sweet and spicy sauce would be good. I ended up making it too spicy, so I have adjusted the spices below. First I sauteéd the onions until they were starting to get slightly brown, then I added the mushrooms and continued cooking until most of their liquid had been cooked off. Then I sauteéd the peppers for several minutes, and then added the wine. Next I added the tomatoes, beans, sugar, and spices, and simmered for 20 minutes. Finally I added the tomato paste, and served over al dente penne. 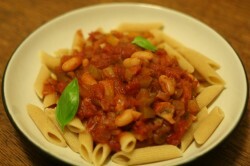 This entry was posted in cooking and tagged cannellini, mushroom, pasta, pepper. Bookmark the permalink.